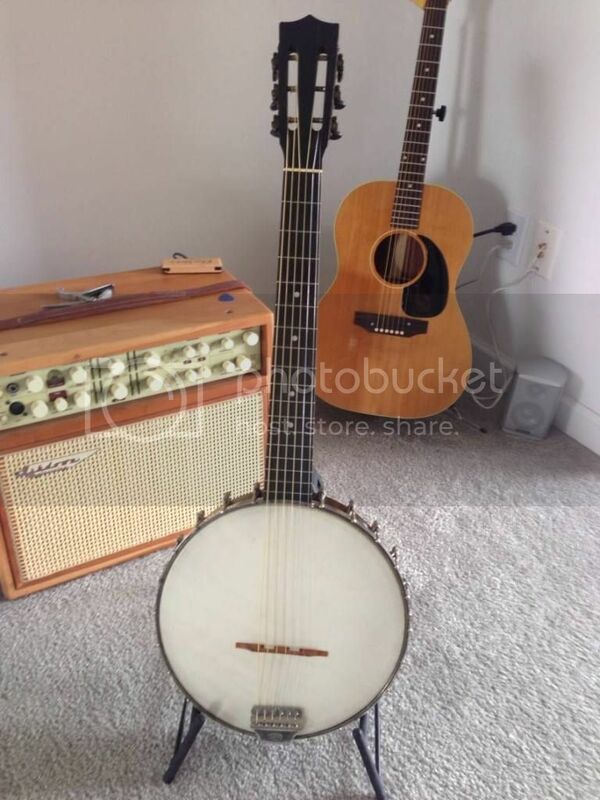 I was given a Washburn banjo with a six string guitar neck. It is open on the backside and says Washburn Style D D 2347. It has a slotted headstock. It also says Lyon and Healy on the tail piece. Any info would be appreciated. Is it a wall hanger or a player ? Welcome to the forum. I know nothing about your banjo. I hope some one does, as I thought 6 string banjo's were a relatively new thing. But I THINK the Lyon & Healy make it a few years older than I would have thought. Tom. Is it a factory made 6 string, or do you mean literally some one put a guitar neck on it? Google seems to be no help. Any tips on uploading pics from an email. These are not uncommon...think they may be called guitarjos. They are built on a guitar scale...never seemed to really catch on, perhaps b/c it's not that much of a stretch to learn to play a banjo. Tenor banjos and 5-string banjos have different scales, IIRC, and as popular as 5-string banjos are in bluegrass, tenor (4-string) banjos have gained favor as a "group" instrument...entire bands made up of tenor banjos. 6-string banjos tune just like a guitar and play just like a guitar...that would seem to be a great option for us guitarists, but they still appear to be very uncommon. I can setup a gallery and host it on my server, donate the bandwidth and usage to this site. Who would I contact for that? I would start with Webguy he works for Washburn, and mods this site. Tom. I think a web site with a pic and brief description of every Washburn made would be nice. Or at least all the ones that can be found or photographed. I unfortunately am not tech savey enough to do it. But Google usually works pretty good. Tom. I'll be throwing something together open to public use. Might lock it down to some of the known active/full members on this site at first though.